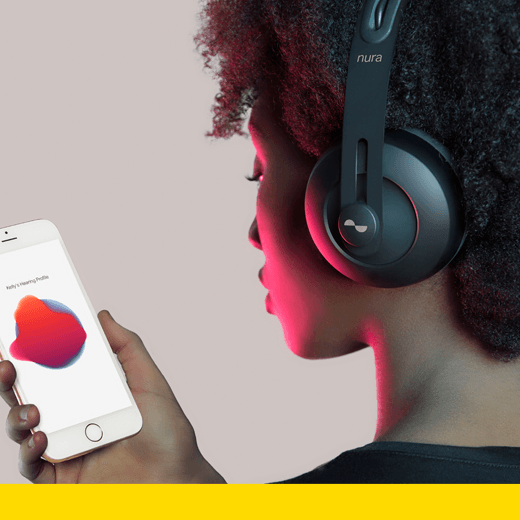 The nuraphone is the world’s first headphone to automatically learn and adapt to your unique hearing, bringing your music back into sharp focus. When you first put nuraphone on, it plays a series of tones that elicit a signal in your ear called the oto-acoustic emission. This is detected by the nuraphone and used to craft your unique hearing profile and balance your music perfectly. The music is delivered via a highly innovative in- and over-ear architecture that produces deep bass you can feel while preserving crystal-clear tones. It works by splitting the melodic notes to an in-ear speaker and bass sounds to an over-ear tactile driver that delivers the sound through your skin adding a haptic dimension to the experience. For the first time, you can adjust your level of immersion and truly feel like you are standing in the front row of a concert.